DVD Synopsis: After violently murdering his mother and her lover, young Patrick lays comatose in a small private hospital. When a pretty young nurse, just separated from her husband, begins working at the hospital, she senses that Patrick is trying to communicate with her, while others in her life are being killed in most mysterious ways. So just how effective can a horror film be if its title character spends most of his time in a coma? If that film is Patrick, the answer is...pretty damn effective! A psychological thriller, Patrick succeeds in generating real fear for a character that never gets out of bed, a deeply disturbed young man who can control the world around him with his mind. Susan Penhaligon is very good as Patrick's nurse, but it's Robert Thompson as Patrick who you'll remember, despite the fact he does little more than lie in bed and stare. 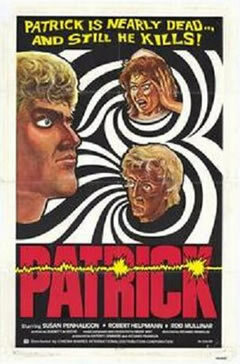 An unnerving film with a truly shocking final scene, Patrick is one you won't want to miss. Wow, this review left relly interested. Thanks for the comment, and the kind words. Yes, Patrick is definitely an unusual film, but in a very good way. Check it out if you can, and let me know what you think of it. I'd definitely be interested in hearing your opinion.